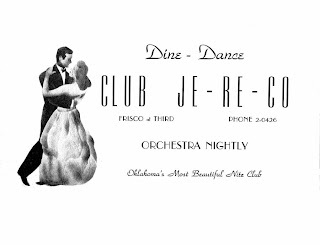 Tulsa’s nightclub scene in the 1940’s got even better after the war when servicemen such as my dad returned and joined others in playing Big Band music on weekends at Tulsa’s swingin’ nightspots. During the week, dad was attending TU on the GI bill, learning about radio broadcasting and eventually becoming the first station manager at KWGS. Later he hosted “Listen With Larry” on KOME. I recall him telling us about his Man On The Street days and getting to interview some famous people. He was there, amidst the huge crowds, covering the movie premier of “Tulsa”. And on the weekends, he was “keeping his hand in” the music he loved. 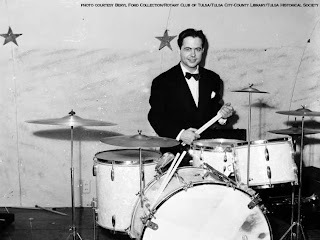 Dad was a drummer and apparently a very good one at that. We never actually heard him play any, as he gave all of that up when he married mom and settled down. 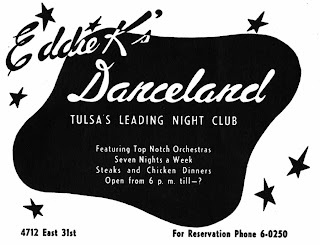 Tulsa had some great nightclubs or dinner clubs. 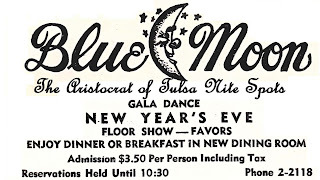 One of the most popular ones was The Blue Moon. 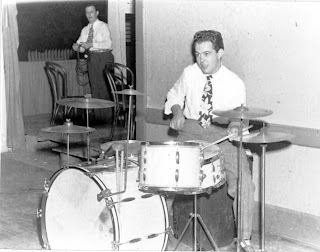 Johnny always closed his show at 8:00 pm with Basically Blues performed by Buddy Rich. At our urging (and I’m sure dad’s secret pleasure) we urged him to turn it up when that song came on. He seemed to time it perfectly that we would be on the way home when that song came on. The album was made in 1966 and re-released in 1996 much to my joy. You can listen to it now, if you want to. I can dig it. 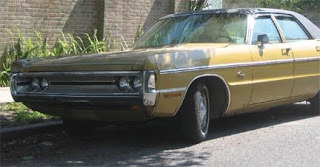 I'm sort of stuck in the 1960's/1970's this week. 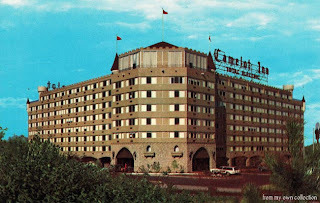 Who doesn't remember The Camelot? 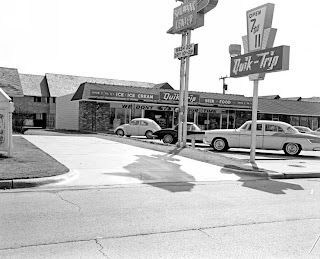 Down the street south was the first Quik Trip store. I still love a Coke Koolee (they will always be Koolees, I don’t care what they try to call them now) and will always remember that jingle. 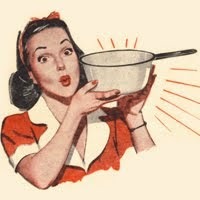 “Hooray for Koolee! yeah yeah yeah!” OK I’ll stop. This picture is actually one located on Lewis. 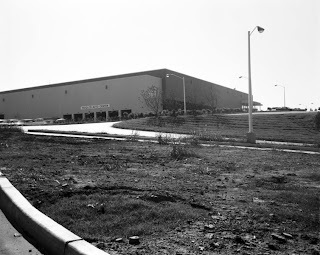 Over at 41st and Yale, Southroads Mall and Southland were introduced. I remember wanting to know what the heck a “mall” was. And I soon learned. 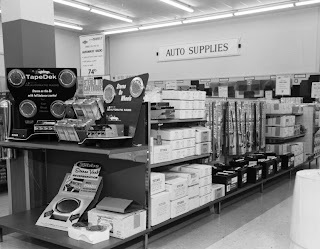 Where Reasors now sits was originally a Woolco Store. Check out the newest thing: A CAR STEREO AND TAPE DECK!- kind of pricey for back then! And Southland was a whole new world. 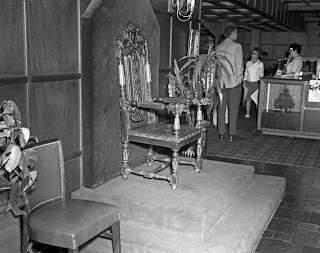 Lerner’s and Penny’s were my favorite places to hang out. I bought a LOT of 45 records at Penny’s. My Mom loved having a Brown Dunkin (now Dillards)close by. 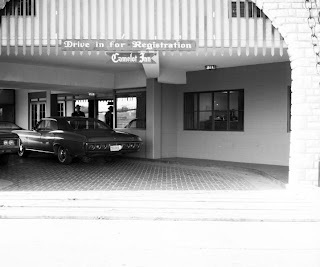 One last photo taken in 1969. 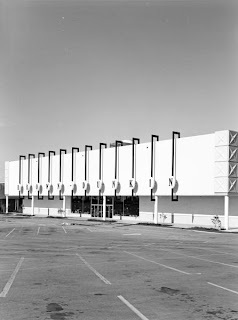 Perhaps one of the last, sad images of where Tulsa's heart used to be, where it all started. 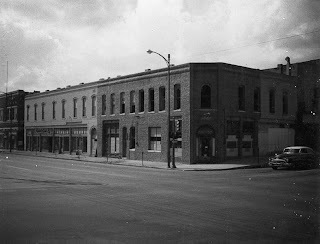 The northwest corner of 1st and Main- before it was torn down and demolished. 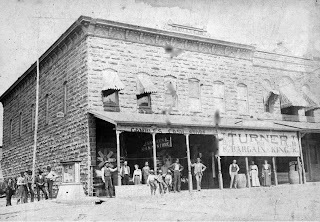 That was the Hall store, built in 1902. Urban Renewal is not a new (or happy) subject for most of us. It's one of those "don't get me started" kind of things. 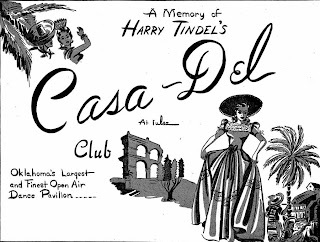 However in dealing with Tulsa's history it is hard to avoid the topic. But I will save it for another day. All day today, I’ve been hearing REM’s “Man on the Moon” refrain in my head. Some times you really do remember exactly where you were, what you were doing and thinking when a significant event occurred. July 20, 1969 - We had been in our newly built house in Sungate for 5 years and were no longer considered “out in the country” (or outside of city limits). I was a child of 11 years old and had been enjoying a typical summer evening out playing with the other neighborhood kids, I’m sure playing some version of Good Guys vs Outlaws or I Spy. On this night, my Grandpa came over for dinner and stayed very late for him. Way past his bedtime, he said. But it was to witness history being made. 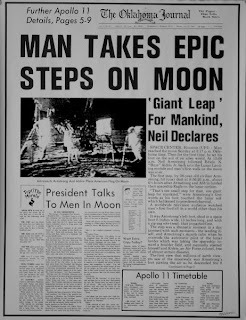 I was aware of what was to take place, that the Apollo 11 had landed on the moon earlier and Neil Armstrong was going to get out and walk on the moon. It all seemed so science fiction and unreal to me. Looking back, I can only imagine what it must have been like for Grandpa. Born in 1895, he was 73 years old this day and had seen his share of history in transportation: the airplane, the helicopter, the Model-T, the jet engine, the turboprop airplane, the hovercraft, and rockets. Rockets that were now taking man out of our world, as we knew it, into another one. I remember running outside several times and looking up at that big, bright moon wishing I could really SEE them up there then running back inside to look at the grainy picture on our RCA color TV set and I was amazed. I can only imagine what my Grandpa must have felt. I do remember him saying to me several times that I would remember this night, that this was history and it was going to change everything. He just didn’t seem really happy, to me, about this change. I sensed a kind of uneasiness about him. Grandpa passed away about 18 months later. He died during what must have been a very turbulent time for him, having grown up when things were so vastly different. But it was he who passed on to me, grandchild number 5, the interest and important value of history- family mostly, but world history as well and for that I am eternally grateful. I had lunch at the Brook the other day with some friends. Some of the non-Tulsans asked if anyone had ever gone there to see a movie. That sparked some memories for me, but not really so much of movies, although I do recall seeing The Sound of Music there. 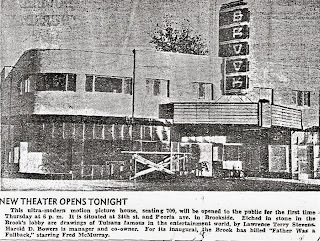 The Brook Theater at 34th & Peoria opened in 1945. 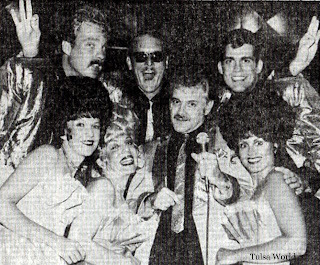 As the news clipping notes, the Brook’s lobby had drawings of Tulsans famous in the entertainment world etched into the cinder-block walls. I’m told you can still see the top half of some of the faces on the walls upstairs. The first movie shown there was “Father Was a Fullback” starring Fred McMurray. 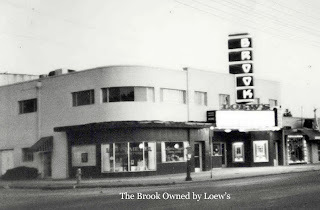 The Brook served as the home of the American Theatre Company for awhile. They tried to raise the money to buy the Brook, but legal wrangling with the owner over asbestos removal put an end to that dream. 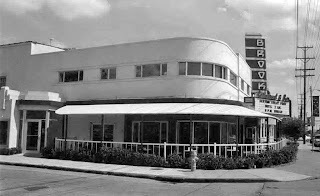 The building sat empty and slowly deteriorated until Tulsan Jim Glass’s company renovated it. The area we were eating lunch in was where the bookstore used to be, but the original beams and textures are still there. The lunchtime discussion had me remembering some crazy times and interesting musicians. Crazy times: American Theatre Company’s Joyce Martel – an “Adult-Oriented Cabaret Show” that Melanie Fry starred in and was hilarious! 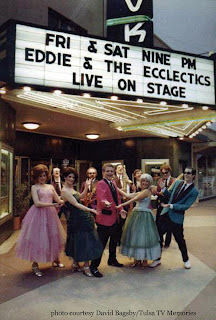 Then there was ATC’s Eddie and the Ecclectics, which began in 1980. 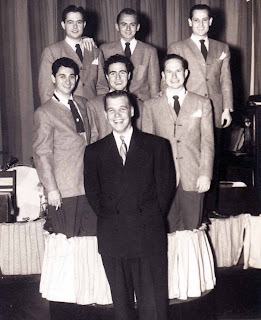 It was the musical story of Eddie Edwards- a legend in his own mind who claimed to have written all of the great rock-n-roll hits. The show revived about 60 of those golden oldies and had a 7-member cast that changed some over the years. The first Eddie was played by Bob Bethell from 1980-87 and again in 1989. 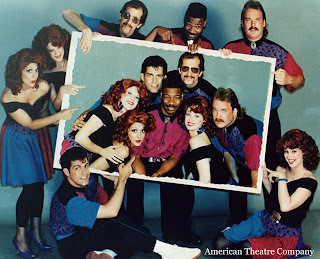 Gene Crose was Eddie for the 1988 run and Michael Silva played Eddie in a couple of special performances. My sister joined the cast at the same time the late, great Tyrone Wilkerson came on board as the 4th Eddie in 1990. 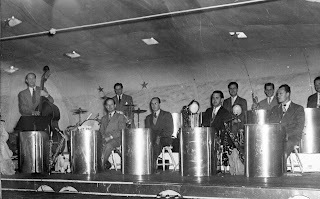 She was LuLu LaRue (far left), one of the Eddiettes. By this time the shows were at the Brady, come to think of it. Then there were the interesting musicians. Two of my favorite “underground” singers in the 70’s and 80’s were the late Jimmie Spheeris and Shawn Phillips (if you haven’t heard of these guys you are in the majority, believe me) I remember thinking it was so great that these little-known artists came to Tulsa to give us a thrill and memories of a lifetime at the Brook. On August 7, 1882 when the train tracks and crew reached the new site, there was a little community of tents set up that awaited them in what was to become Tulsa. 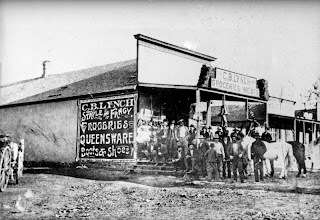 The crew headed over to the largest one, Chauncey Owen’s wooden-sided “boardinghouse” tent which had hastily been put up. 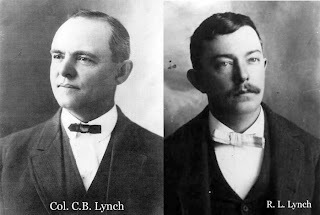 Owen had been following the railroad grading work from Vinita, hauling the large tent along the way and supplying the hundreds of workers, including the Hall brothers, with beef and produce from his farm near Broken Arrow. His tent was a store as well as a boardinghouse. Chauncey A. Owen was a Pennsylvanian entrepreneur and Civil War veteran who conducted a freighting business in Kansas before coming to Indian Territory and marrying Jane Wolfe, a Creek Indian. 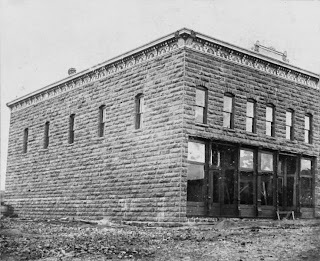 He was already in the boardinghouse business on the bank of the Arkansas River before the railroad began heading this way and quickly moved his business to the new location. After the Hall brothers set up their store tent that summer evening in 1882, they made their way over to Owen’s tent to sample his wife’s home cooking. 1) Elm Tree Tent where the first baby in Tulsa was born. 2) The log house of Noah Partridge, a Creek Indian, and his family. The Partridges were the only family living here when the town was located. 3) The Frisco railroad grade stakes. The contractors were grading about where Madison Street crosses the railroad tracks. 4) T.J. Archer's Tent Store. 5) The Hall brother's tent while waiting for store building to be completed. 6) C.A. & Mrs. Owen's boarding tent while waiting for hotel to be built. 7) Mr. & Mrs. Slater's tent. Mr. Slater was a carpenter who worked on the depot, roundhouse and section house of the Frisco Railroad Company. 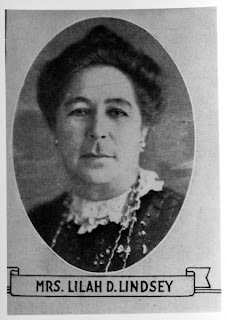 Mrs. Slater organized the first Sunday School in Tulsa from their tent. 8) Dr. Booker's tent. Tulsa's first doctor. 9) Now known as Main Street. 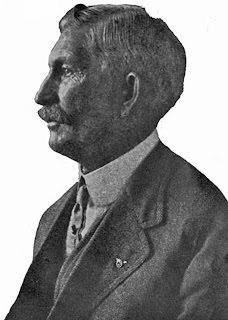 Mr. Owen began immediately building the first hotel in Tulsa; a six-room, two-story wood frame building which was appropriately named the Tulsa Hotel and opened in the fall of 1882. 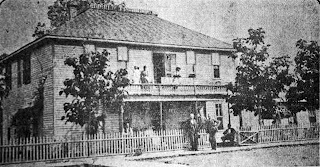 Mrs. Owen (aka Aunt Jane) ran the boarding house along with Chauncey until 1890 when it was leased and renamed St. Elmo. 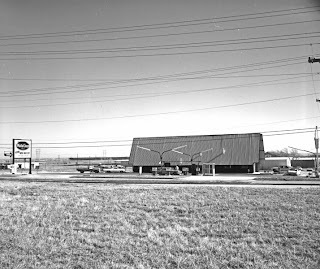 Owen also owned and operated the first wagon and feed yard in Tulsa, next to the railroad. 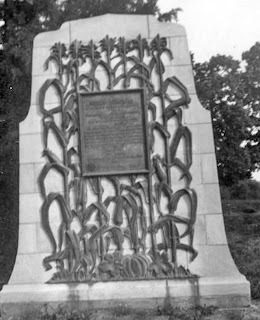 Mrs. Owen died in 1902 and her heirs received an allotment of 160 acres from the Creek Nation which includes what is now Owen Park and the neighborhood. 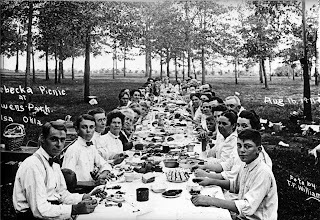 In the early 20th Century the lands of Owen Park were often used for public events such as Fourth of July celebrations, Labor Day picnics and family gatherings. 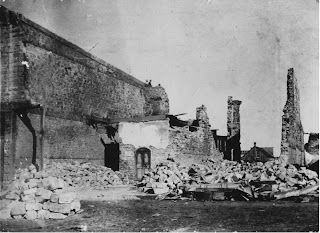 Photo below circa 1911: On January 23, 1904 a tremendous explosion rocked west Tulsa and was heard as far away as Claremore. A replacement employee by the name of McDonald was working for Western Torpedo Company- which supplied oil workers with the needed nitroglycerin used for shooting oil wells. 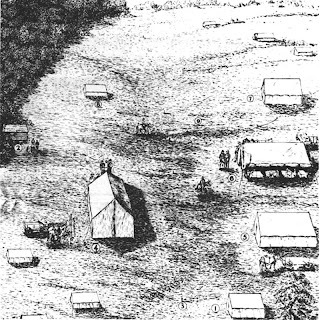 McDonald entered a wooden structure where the explosives were stored (on the land leased from Owen) and the entire stock was accidentally detonated. 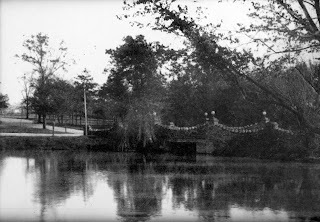 Mr. McDonald did not survive and the crater that was created became known as Owen Park Lake (now Owen Park Pond) after the city purchased the land in 1909. Tulsa’s first city park became a reality. People were concerned that it was “so far out” that the city promised (and delivered) a streetcar that ran from downtown to Owen Park to Orcutt Park and back. This memorial maker in Owen Park denotes the Creek, Cherokee and Osage Indian Nations corner, where all 3 meet. 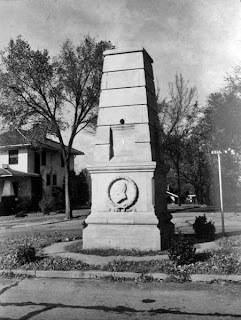 The Washington Irving monument stands at West Easton St. and Vancouver Ave; it denotes where famed author Washington Irving camped in October of 1832. 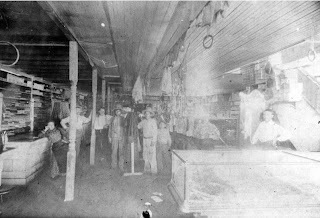 Inside the store- note the dishes and groceries: C.B.’s brother Robert built the first stone structure in town, using hand-cut stones quarried in the nearby town of Dawson and hauled by wagon to Tulsa. Inside the store- this was apprently the place to buy a bucket! 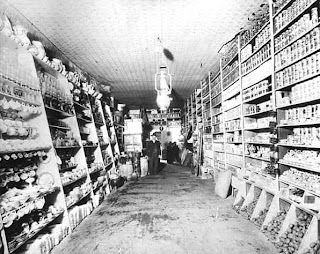 Each store carried their own variety of goods. 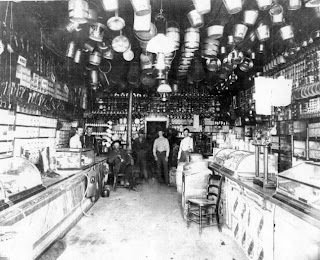 For instance, Jeff Archer's store carried a large supply of lanterns. 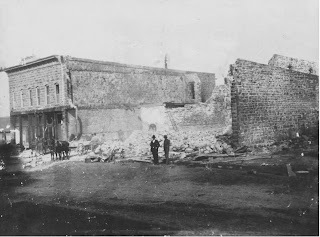 The Fire of 1897 burned down almost half of Main Street. Tulsa Banking Company was destroyed, yet the safe survived intact. The Lynch store, on the far left, was spared. 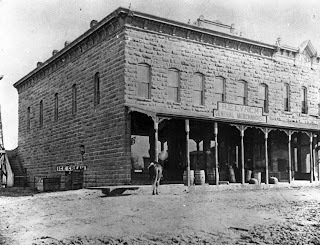 The banking business was conducted at Halls Store until the bank was rebuilt on the same lot. 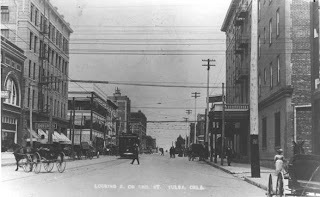 Below you can see (from l to r) the south end of the Lynch/Turner building, the bank building and the fancy Price Gillette Store: C.B. Lynch sold the building to Mr. Turner. 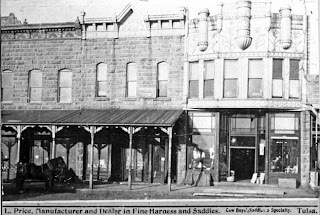 He renamed the building and a cash store was opened in it by Mr. Gamble. The Lynch/Turner building had a fascinating life as one of Tulsa's first movie theatres soon after. 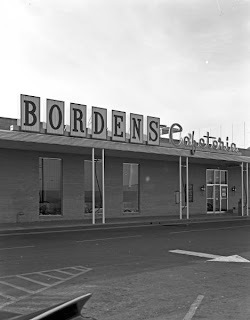 It was torn down in 1970. 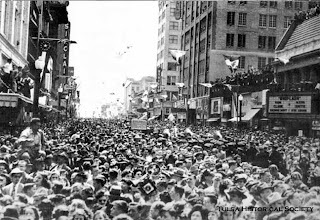 Tulsa’s very first 4th of July celebration reportedly was held in 1884 in a peach orchard near “the old graveyard” on West Second Street. People came from within a 40 mile radius to hear the speeches that were read from the large platform that was erected. Afterward, there was a big picnic dinner and dancing till late. The next day was a Saturday and the dancing continued. Sunday morning, preaching services were arranged. 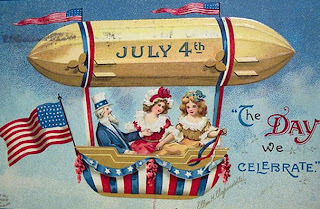 The 4th of July celebration of 1887 seems to be the best documented one of that era. That year the celebration was held in the form of a barbecue and Mrs. Lilah Lindsey, a teacher from the mission school, was in charge of decorating Jack Wimberley’s wide wagon bed for the parade to the picnic grounds. The citizens all marched alongside the wagon pulled by oxen through the woods to the clearing. Mrs. Lindsey’s organ was placed on the wagon as well as chairs for a dozen young girls to sit in while wearing patriotic costumes. There was the usual “speakin’” and then a barbecue and dancing after. 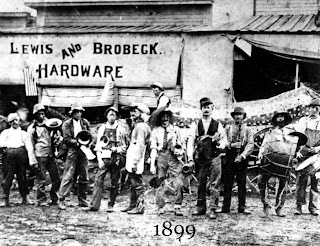 This may or may not be the 1887 4th of July, but it is a sure bet that those are Jack Wimberley’s oxen and wagon: Here is the Tulsa Band posing on July 4, 1899 in front of Lewis and Brobeck Hardware on the east side of Main between 1st & 2nd Streets. 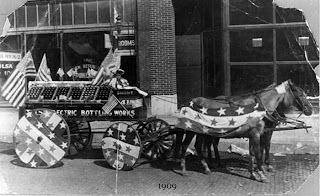 Tulsa Electric Bottling Works wagon decorated for a Fourth of July parade, circa 1909. The wagon is in front of the Indian Republican Publishing Company at West 1st Street. Tulsa Gal wishes you and yours a safe holiday.